A new era of ‘good fire’ and collaborative vegetation management is here, now. Imagine a North Bay that lives harmoniously with fire and understands its critical role in tending our cherished and beautiful open spaces. Fire Forward, a program of Audubon Canyon Ranch, brings a unique blend of science-based program design and community organizing to our region as it seeks to become a model of fire-adapted communities tending fire-adapted landscapes. Teaming up with private landowners, public agencies and conservation partners around a shared purpose of effective fuel management. TALKS & WORKSHOPS: Attend a Good Fire Alliance info session or join a workshop on a range of fuels management approaches, like grazing, creating shaded fuel breaks and home hardening. Building our region’s capacity to accomplish this work through prescribed ﬁre training and equipment sharing. TRAINING & EQUIPMENT: Our Wildland Fire Fighter Type 2 training is designed to build a local cadre of prescribed fire participants. Our mobile unit of prescribed fire and understory thinning tools will be available as a shared resource across the region. Working with partners to implement ecologically sound ﬁre and fuels treatments on ACR preserves and partners’ lands. 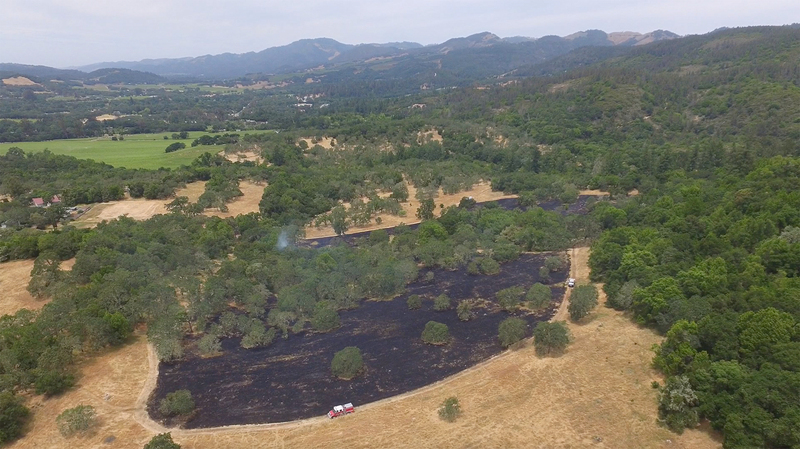 TREATMENTS & FOLLOW-UP: By working closely with CAL FIRE, partners in the Sonoma Valley Fire and Vegetation Management Collaborative, our own preserve managers and other regional landowners, we are making North Bay ecosystems more resilient and our communities safer. Fuels treatments on our own lands are paired with monitoring protocols and data collection to inform management moving forward. Fire Forward is funded in part by the Farley Family Charitable Foundation, the Federated Indians of Graton Rancheria, the California Forest Improvement Program, and many generous members and supporters of ACR. What does ‘fire-adapted landscape’ mean? Fire is a core ecological process in most California ecosystems. For thousands of years, the Bay Area was home to some of California’s highest populations of Native Americans, who used fire for a multitude of reasons: to generate fresh forage for grazing and browsing mammals, to stimulate growth of valuable basket weaving materials, to control acorn weevil populations ensuring delectable acorns for wildlife and people alike, to reduce fire hazard around home sites, to clear walking paths, and so much more. In the North Bay specifically, nearly all of our terrestrial ecosystems depend on site-specific fire regimes. Here, nearly all plant species depend on regular fire to thrive—each system with its own unique relationship with fire and specific fire needs. Our open spaces are adapted to a specific fre- quency, intensity and timing of fire as a result of those millennia of fire-adapted stewardship by people. After over a century of fire suppression, however, California landscapes remain in a dire fire deficit. Why use prescribed fire in the North Bay? The use of prescribed fire (i.e. controlled burning) builds resiliency in wildland ecosystems, reduces hazardous fuels and may enhance public and firefighter safety. Local communities can benefit in other ways too. When relatively small areas are burned under optimal conditions far less smoke is emitted than would occur during a major wildfire and the potential for post-fire erosion is reduced. Fire management professionals, scientists and land managers concur on the benefits of controlled burning and the State of California is supporting significant increases in its use in the coming years. Fuels treatments consists of a range of activities, including mowing, grazing, vegetation thinning, pile burning of thinned or dropped limbs, controlled burns in grassland, oak savanna, woodlands and forests, as well as installing shaded fuel breaks (i.e. forested fire breaks) to help maintain access for land managers and emergency personnel. Controlled burns are managed to minimize smoke impacts. Smoke and emissions from controlled burns are significantly less negatively impactful than those from wildfires. The Bay Area Air Quality Management District has strict controls on when prescribed burns may occur in order to ensure that weather conditions are appropriate to dissipate the smoke. We will not be able to proceed with the burn until we get a green light from the Air District the morning of the burn. Additionally, if smoke somehow unexpectedly becomes a public health problem, contingency response plans are in place to reduce smoke problems, which include extinguishing the fire if necessary. What about animals living in the burn zone? Animals that live in California’s landscapes coevolved with regular fires in their native habitat. Many of these animals even depend on fire to maintain their habitat. During a burn, research has shown that ground burrowing animals typically survive fires by staying in their burrows until the fire has passed. Additionally, in the year following a controlled burn in grassland or oak savannah, an increase in the presence of deer is commonly noted due to improved forage quality. What is the Good Fire Alliance? The Good Fire Alliance is a group of private landowners who have come together to learn how to manage the vegetation needs of their properties through controlled burning and other techniques. The group strives to be a network of support for cooperatively conducted burns in the North Bay. To learn more about the Good Fire Alliance, email Jared.Childress@egret.org. What is the Sonoma Valley Fire and Vegetation Management Collaborative? The Collaborative is a group of six conservation organizations and land management agencies that have agreed to coordinate fire and vegetation management with each other and with CAL FIRE’s Sonoma Lake Napa Unit (LNU) in the Sonoma Valley region. Members of the Collaborative are Audubon Canyon Ranch, California State Parks, Sonoma County Ag + Open Space, Sonoma County Regional Parks, Sonoma Land Trust, and Sonoma Mountain Ranch Preservation Foundation. Together the members own and manage about 18,000 acres of protected lands in the region. What is the Bay Area Prescribed Fire Council? ACR is a founding member of the Bay Area Prescribed Fire Council, a growing group of nearly six dozen Bay Area fire agencies, environmental organizations and academic labs who are sharing best practices around prescribed fire. For more information contact Sasha.Berleman@egret.org.